Test of Nationwide Alert System Planned for October 3, 2018. 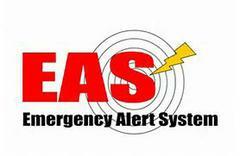 IPAWS National Test of the Wireless Emergency Alert (WEA) and Emergency Alert System (EAS). The National EAS and WEA test will begin at 2:18 p.m. EDT on Wednesday, October 3, 2018. Cell towers will broadcast the WEA test for approximately 30 minutes beginning at 2:18 p.m. EDT. During this time, WEA compatible cell phones that are switched on, within range of an active cell tower, and whose wireless provider participates in WEA should be capable of receiving the test message. Some cell phones will not receive the test message, and cell phones should only receive the message once.